Come join Kathleen and Breezi for some all night fun! Bring and treat and play till you drop! 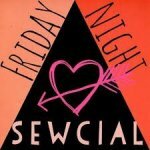 The Friday Night Sewcial is $10. For your $10 you will receive DINNER and $5 in store credit (good for that night only). This class fills up fast, so don't delay in reserving your seat. Our 7th annual Great Strip Race is happening in February! This year, we will be doing an super cute Strip Quilt featuring hot air balloons, which is perfect for 2-1/2in pre-cut strips (Jelly Rolls). Our Great Strip Race is famous for snacks, silly games with prizes, and lots of laughing as we quilt! This class fills up quickly, so be sure to sign up now. This is a fun quilt to make. The blocks come together very quickly and it looks much harder to make than it actually is. You get to use a fun new tool, the Creative grids 60 degree ruler (different from the 60 degree triangle ruler). To have some fun playing with color gradients and new techniques we'll see you at the class! Would you like to make your own yarn to knit or crochet? Make your gloves, socks, awesome knitted sweater with cool fibers? Then, this is the class for you! Our instructor comes from New York and will include your own drop spindle and 4 ounces of hand dyed roving wool to keep. Bring a friend and come play! This table runner is fun and versatile! You will just love this new addition in your home. Choose to make a full apron or a Hipster! Super cute, functional, and you learn tips and tricks to making the fun curved hem. Bring a friend or a youngster to make one with you! WE ARE SO LUCKY! Katrina Walker is coming to us from Spokane, WA, and will be our featured guest instructor at our Event, showcasing and teaching Serging and/or Machine Embroider. You can choose one or both of her classes! Katrina Walker is a designer, educator and author known for her expertise in construction techniques, textiles, machine embroidery, and Modern American Pojagi piecework. Her work is regularly featured in sewing magazines including Threads, Creative Machine Embroidery, SewStylish, Stitch, SewNews, and SewItAll. She is a popular instructor both at national sewing shows and online, where her classes for Bluprint (Craftsy), Taunton Workshops, BurdaStyle, and Craft Daily have enrolled thousands of students worldwide. She is a national educator for Husqvarna Viking and PFAFF sewing machines, and a Sulky Sewcialite. When not sharing the love of sewing, she is raising her own natural colored wool for her Spoiled Sheep yarn (spoiledsheep.com). You can find her online at www.katrinawalker.com. This is a great class to learn how to make paper-pieced blocks. During this class you will be making 3 blocks, from easy to intermediate to more difficult. DeAnn will go through this process with you with expert care and instructions. We hope this sparks joy and confidence in paper piecing! 4-Day retreat, including Monique Kleinhans classes on landscape quilting and an elective training on Premier Embroidery Software !